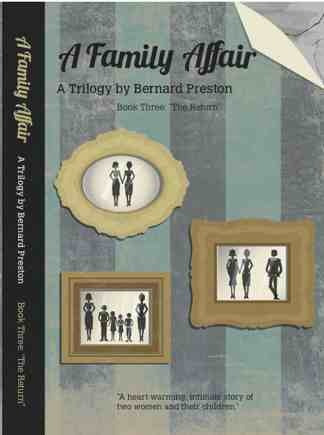 A Family Affair reviews gives you some idea of what the book is about. Readers of Bernard Preston’s previous three books will not be disappointed with his latest work; despite the absence of a chiropractor. The theme of The Bostonians, the first book in the trilogy, A Family Affair, revolves around some serious modern day issues; but his easy to read style makes for compelling reading. The author’s ability to make his characters engaging as they become entangled in difficult relationships, whilst retaining a light hearted theme, is commendable. Another page turner from a natural storyteller. Target audience A FAMILY AFFAIR ... who was this book written for anyway? "A Family Affair tackles some tough subjects without apology. As the book opens the reader is drawn into a web of deception and betrayal amidst convoluted family dynamics. The story unfolds to reveal dark secrets that have profoundly impacted the lives of the main characters, Santie and Janet. As the author takes us back in time we gain an understanding of their young lives and the inevitable crossing of their paths. Dramatic events lead to significant life choices for both women and the stage is set for us to want to read on to see how things develop. Throughout, there is a spiritual thread that explores the issues of faith. Deep, abiding faith is tested by earth-shattering events while questions are raised by wounded, angry people filled with doubt and scorn. We are left asking ourselves how faith plays out in our own lives." A compelling tale from the beginning. Blew through the story in two days. A story right in line with the latest Freedom, finally now backed by 14 countries and about the same number of USA states. Finally, slowly, we are accepting the right of all people to love without prejudice, not condemning or blackmailing. A story first drafted well ahead of its time. The author approaches a difficult subject with sensitivity and compassion. I found it a bit difficult to put down, I wanted to read through to the end to see how the story would unfold. Walloping good read for anyone who wants a fast paced weekend read that's relevant and poignant and stimulates the brain cells without taxing them to death. Highly recommended. Characters are very real and the issues so relevant you'll not put it down. My only crit would be that the writers voice occasionally peeps over the horizon but not intrusively so, so read it and you'll not regret. Have a review for A Family Affair? Did you enjoy A Family Affair? Or, hate it! Or found it boring? Tell us. TIP: Since most people scan Web pages, just the way you are doing right now, include your best thoughts in your first paragraph. Clearly, despite serious doubts on the part of most straight people, homosexuality is clearly not going to go away. Will it become like divorce? Only a few decades ago, divorcees were excommunicated, refused re-marriage in the church and now there are divorcees in leading Christians positions? The trilogy continues. Santie goes to Italy to locate her family, discovering a half brother. Only Georgiou is different; he's a secretly married cardinal. He is elected to the highest office in Christendom. The young priest is overworking and is sent by his superior on a retreat. Only, giving mass at his best friend's chapel to a young woman he is instantly smitten; and so is she, though both live in denial. Two years of great pain is mingled with equally consuming joy. It will be some years before Pope is published, but here's a chaser. Cleo hurried through the village with a jar of honey in the bag slung over her shoulder to the wood and iron house at the upper end of the village; it was a warm day and the sweat was beginning to prick from her skin when she reached Aria’s home. She had to leap over a trench where a gang of men were laying a brand new blue plastic water pipe. She recognised the young man who lifted his hat with a smile, but didn’t know his name. He was new in the village, drawn by the work on offer at Cleo's fiance's factory. Peering down into the hole she could see why the villagers were always complaining about the water, or rather the lack thereof. The ancient iron pipe had rusted right though in places. There were grunts and shouts, and a few curses, from the men in the trench who hadn’t seen her. ‘It’s a lucky man who’ll be marrying you in two weeks,’ cried one of the others. ‘Thank him for all the work he’s brought to the village.’ He was dressed in a dirty brown pair of overalls, and long black gumboots covered in mud in the trench. ‘Thank you,’ she replied sombrely. ‘I’ll tell him.’ Just across from the trench lay Aria’s home. The ornate gate, crafted three generations before by Dino’s grandfather gave a little squeak announcing her arrival. She knocked at the front door, not waiting for a reply, and entered. She found her friend in her studio, peering over a large painting on an easel facing the light streaming in from the hills above the village. With a squeal, Aria flung a cloth across her work. ‘What is it?’ asked Clio. ‘Oh, and are you superstitious? Luckily Dino brought home a five litre drum of water; they warned us there would be no water today.’ Opening the little tap, she filled the kettle for cappuccino. ‘No, I’m not really, but peering into other people’s eyes makes you realise there’s another world out there that we don’t see. Taking the locket, she peered long at the tiny miniature. Aria watched as the colours in her friend’s cheeks, and the sparkles in her eyes abruptly faded as Cleo took her head in her hands, the long black curls falling forwards. Her shoulders started to shake and tears dripped from between her fingers and falling onto her lap. Tiny squeals of pain erupted despite her best efforts. Placing the locket on a small table next to her chair, Aria stood up and went to the kitchen. Clio wiped her cheeks with a tiny handkerchief, embroidered by her grandmother, and kept neatly folded in her top drawer with a bag of dried thyme and rosemary. She could hear the sounds of the percolator and hot milk being frothed. Soon Aria appeared with a tray. ‘They are; actually they are made specially for painting miniatures. It’s a dying art, I’m afraid, but there are a few of us who like to keep it alive.’ The two women looked at each other for a moment, and then Aria rose and turned on a small lamp. ‘Look, it’s almost completely dark now. Let’s go out and look. I’ve never seen an eclipse of the sun before.’ Taking it in turns to peer through the darkened glasses they stood in awe staring into the darkened sky. Seeing solar panels on Aria’s roof, she felt a very tiny glow somewhere near her bosom. Just then baby Dino gave a cry from within the house. Startled, Aria darted inside, leaving Cleo to follow more leisurely. First, she poured half a cup of coffee and then distracted, peered out the window at the men digging in the trench; they were dragging out the old, rotten pipe. Light was again covering the Earth and she dared not peer at the sun. Turning again, she spied the easel, covered by a cloth, facing the window on the opposite side; the one that looked out on the mountain. Making sure Aria was nowhere to be seen, she tip toed over and tentatively pulled back the cloth. With a little cry, she clutched her mouth. It was far from finished, but there was no mistaking Cleo on Rajah, hooves in full gallop, with a look of triumph on her face. With his back to her, riding on the piebald, was another unmistakeable person; a priest in his black frock, the dog-collar clearly evident. ‘You shouldn’t have!’ said Aria from behind her. She passed Cleo the child and, grasping a tube of gold paint, moving with the incredible speed of an accomplished artist, painted a ring, a halo of pure gold around his head. It looked exactly like the annular eclipse they had just witnessed. ‘Thank you, Aria; it’s a sign for sure. I must go and help mother with the dinner. Can I ask you for one more thing? Reaching up to the shelf, she chose her favourite icon of St Nicholas. Will you take him to the church, kiss him, and light a candle for me? Tonight, or early tomorrow? Stepping carefully onto the plank over the trench, the men were putting away their tools for the day, they wended their way down the street at the top of the village, past the new supermarket and on to the church square. Everyone seemed to be outside, excitedly gesticulating at the last vestiges of the eclipse. Aria raised her hand in farewell and she opened the heavy old wooden door to the church; Cleo carried home with her the memory of Georgiou’s head eclipsed with a bright golden halo. What would the morrow hold? Dared she again take the road to the forest where she knew he would be out walking?